MIstakes can happen. Whether it is on or off the water, boating accidents occur all the time. The only thing worse than having a boat damaged in an accident or storm, is having that same boat sit at your home or marina for several years without getting it fixed. If you are a boat owner that is looking for someone to repair or renovate your boat, look no further than Anchor Marine Repair. 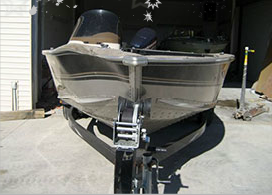 Located in Delano, MN, we serve anyone in need of boats repairs and renovations. We are the number one Minneapolis boat repair service and we look forward to working on your baby soon! All of our technicians take pride in what they do. Every single person on our team has been with us for over 10 years and we make up a combined 45 years of experience in boat repairs, renovations, and refurbishing. Boats are our passion and we are constantly looking for better ways to repair your boat and give it back in better condition than it was before the accident ever took place. For this reason, our technicians stay up to date with the most current technologies and techniques for boat renovations. In order to best serve the state of Minnesota and surrounding areas, we knew we would have to have a great facility. We are proud to own a two building facility close to Lake Minnetonka. With over 10,000 square feet of working space, we are sure that we can accommodate any boat up to 38’ in length. 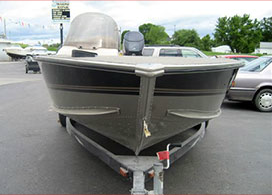 If your boat is broken down or your trailer is not functioning properly, don’t worry. Our professional team at Anchor Marine Repair will pick-up your boat from your dock, home, or marina for free! We offer this to anyone within a 250 mile radius of the Minneapolis/St. Paul area. Whatever the reason that your boat is broken down, Anchor Marine Repair is here to help. If you live in Minnesota, call us today for a free estimate at 763-972-3540.